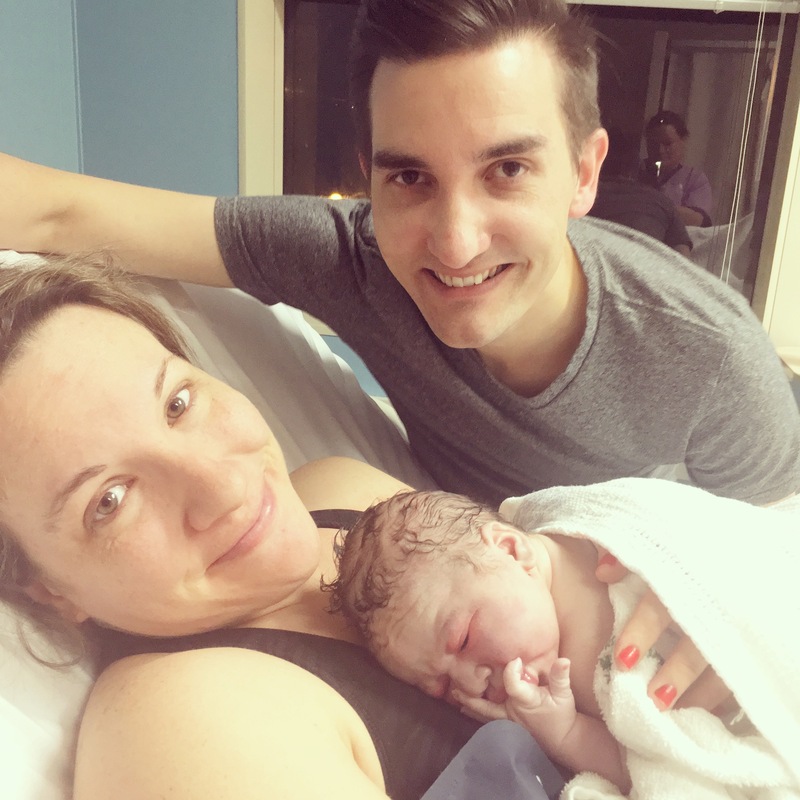 Even though I wrote a couple months ago about taking a maternity leave of sorts, I always had it in my mind to write about our new baby’s birth story. After experiencing birth for the second time, I am so excited to write this story simply because it’s such a completely different story than Eleanor’s. A brief recap of my first experience when we welcomed Eleanor – my water broke at 38 weeks and 3 days. We went to the hospital because there was quite a bit of blood when my water broke, and they wanted to make sure baby was ok. Her heart rate was very high, they gave me fluids, it calmed down, and they sent me home with an appointment 12 hours later to reassess and an induction time the following day if I hadn’t gone into labor on my own. Got home and contractions started. They picked up and intensified. Went to hospital – only 3cm – got sent home. Labored all day with intense back labor at home and went back around 6. At 8:30, the contractions were intense and back labor was draining my energy. They checked me…4cm. Decided to try for a couple more hours but if no progress was made would get an epidural. 10:30pm…4cm. Switched rooms. Got an epidural. After a couple hours, her heart rate started decelerating. They realised she was posterior and made me move positions. They also started a syntocin (pitocin in the US) drip. Another hour, heart decelerating more. Wanted to check her lactate levels and told me if over a certain amount would have to take me back for an emergency c-section. Other Dr. wanted to check me again, and when she did, I was at 9cm! 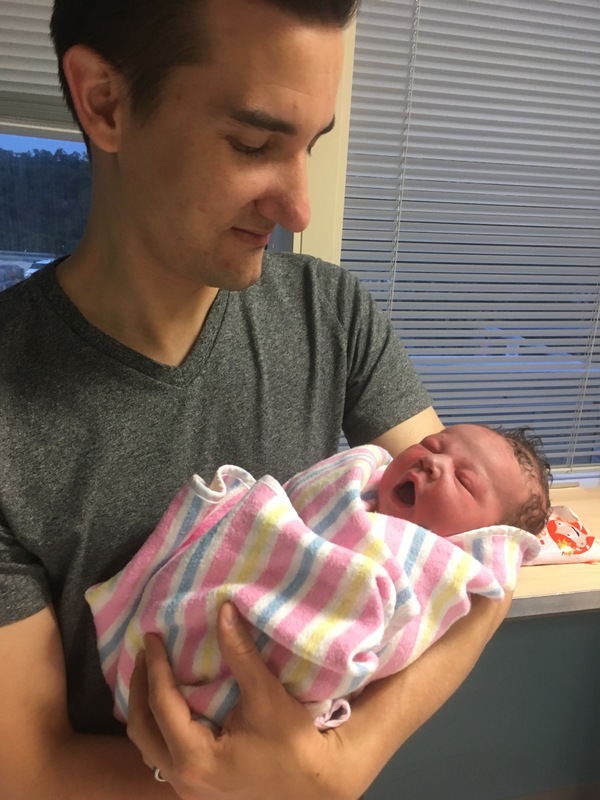 Another 30 min, I was at 10, and 1 hour of pushing after that, Eleanor made her debut! …until you get pregnant again and approach your due date! 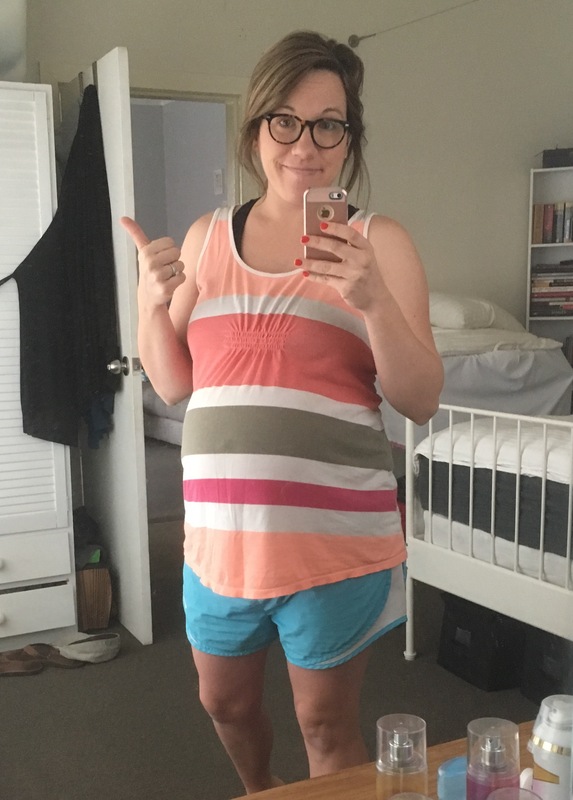 As I passed 33-34 weeks this time, I started getting nervous. 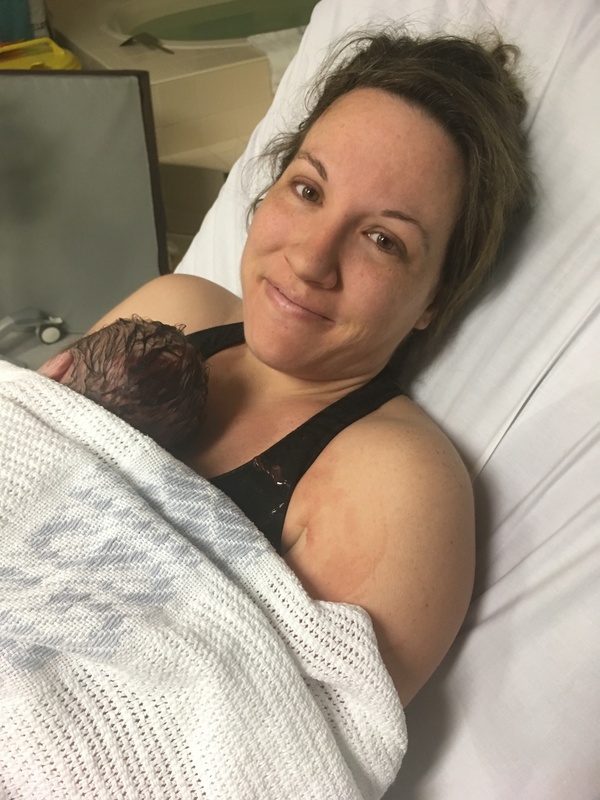 I had hoped to have a natural birth without any medication/pain relief with Eleanor, and even though I am so proud of the hours and hours I endured before getting an epidural, I was doubting I could actually do it naturally this time because of that experience. I also spent the bulk of my pregnancy worried that he would be posterior and that I’d have back labor again. The back labor is what really got me with Eleanor. After I passed 38 weeks and 5 days, I felt like I was late, even though I was technically still early. Oh the joy of your first baby coming early! I tried to mentally be ready for anything, but I don’t think I really prepared myself well enough. On Saturday, 23 September, I woke up as normal. I hung out with Eleanor and Robbie that morning, and we tore off another paper from Eleanor’s countdown until Gaga and Papaw came. Around 9 or 10, I was lying on the couch while she was eating her “second breakfast” and watching Moana, and I felt a pain. I had a brief thought that maybe it was a contraction, but I didn’t think much of it. I had sort of resigned to the idea that this baby wasn’t going to come early. I did think about the date, though, and I thought maybe it could happen since it was my Grandpa’s and my sister’s birthday. Another 15-20 minutes went by, and I felt it again. Nothing too crazy or intense but enough to be distinct and definitely enough to be out of the realm of “braxton hicks”. I mentioned it to Robbie but just continued on. That kept going all day long. This is my “I hope this is it and not just a really long and painful day” face, followed by my giant torpedo belly in the final day before Otis arrived. 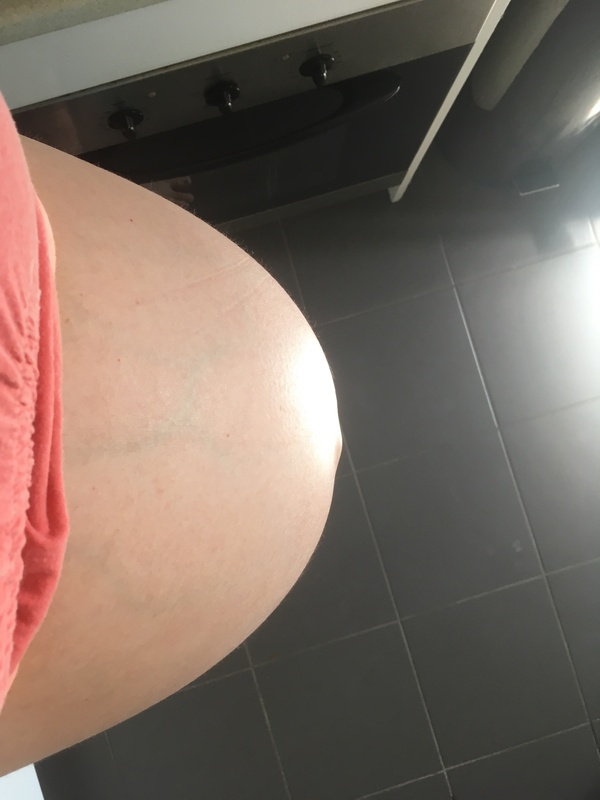 It would be considered “early labor”, but it was tiring both physically and mentally because it was enough that I couldn’t ignore it and yet it wasn’t progressing closer than 15-20 minutes. I went from walking around the yard, sitting on the ball, and climbing stairs hoping to help move things along all the way to giving up and trying to sleep and back again. After we put Eleanor to bed, I went outside, and I cried. My friend Jess came outside and gave me the biggest hug and prayed for me, and soon, Robbie came out and joined as well. I didn’t want to be “defeated”, but I was starting to feel like my body didn’t know how to progress on its own. I was also starting to have back pain, which didn’t help with my fear of him being posterior. I came back inside and decided to take a bath. I knew that lounging back wouldn’t help things along, but it felt like it was the best plan so I could at least relax. My contractions stopped while I was in the bath, and I was able to relax. I spent some time praying and letting go of the idea that this had to go a certain way or even the idea of him being born on my Grandpa and sister’s birthday. The bath really helped, and when I got out, I felt a little more relaxed. About 30-40 minutes after I got out, contractions started again, but they were still slow going and not progressing past the 10-12 minute mark. The back pain also intensified. I went through the process again, and just after midnight, I reached the “defeated” point and called my midwife. I knew I wasn’t ready to go in to the hospital, but I needed some reassurance. My midwife was actually off that day so I got her partner, Bec. Bec said that baby was probably posterior but that just like I suspected, the contractions weren’t doing enough for me to come in. She recommended a heat pack for my back and to try and rest. Like I said, defeated. In my mind, it was happening all over again. The back pain was going to tire me out and my hopes for a natural labor were done. So I sort of “gave up”. I stopped trying to move things along, all my expectations were gone, and I just went to bed. I tried to sleep. That was 12:30am. Apparently that was exactly what needed to happen and what happened next just reinforces my belief that labor is mostly a mental game! A contraction hit me that got me out of bed and on my feet. It was incredibly intense. It was long. It was different. I went to the bathroom and walked around the kitchen a bit as another one hit. I had been keeping track of the contractions on my phone all day, and I continued to do that. I came out to the living room to see if sitting on the ball would help, but I found that incredibly uncomfortable and unhelpful. I went back to the bathroom/kitchen, walking around, leaning into the counter and breathing as contractions continued. I decided to hop in the shower and see if the hot water would help a bit. It definitely helped, but I found myself getting overheated very quickly with the intensity of the contractions. When I got out and powered through another contraction, I looked at my phone. It was only about 2:35 at that point. I was in disbelief that maybe things had shifted and this was actually happening. Because Eleanor’s labor took so long, I was hesitant to call the midwife again. I was super hesitant to go to the hospital too early and be sent home. After another 10 minutes of intense contractions, though, I realised that I was starting to have a hard time distinguishing between when these contractions were starting and stopping, so I called Bec back. Almost immediately after she picked up and I got out “they’ve picked up and gotten really close together”, I was slammed with another contraction. She waited patiently, and when it passed she said she would meet me in at the hospital. Apparently midwives have this special ability to know just where a woman is at based off her breathing during a contraction. I woke up Robbie, who was a bit surprised considering he’d only gone to sleep a couple hours prior. He got dressed and called Sai, our friend who was organised to stay with Eleanor. Fortunately she lives in the flat upstairs, so she came right down. I was already outside waiting by the car. Robbie got the bag in the car and hopped in, and I waited for a contraction to pass before getting into the “box of pain on wheels”! Car rides are THE WORST when you’re in labor, and the pain of it from Eleanor came flooding back as we took off for the hospital. Only this time, it was about a million times worse. I couldn’t sit in the seat so I lifted up and leaned into Robbie’s shoulder…and yelled. We got to the hospital at 3am. I had 4-5 contractions on the walk in. When we got to the ward, we were greeted by Fiona. My friend Jules had just told me about Fiona that week. Fiona did a YWAM DTS back in the day, and she’s now in charge of the midwives at the hospital. I looked up from a contraction, noticed her name tag and said “You’re Jules’ friend!” Even though I had never met her, it was nice to see someone that was somewhat “familiar”. She was so lovely and exactly what I needed as we arrived. She walked with us to the room and worked with me through a couple contractions. When we got to the room, she asked if she could pray for me, and I was so grateful. I immediately asked for the bath, and considering these are massive bathtubs, they started filling it right away. I walked around the room working through contractions. The contractions were so intense and unlike anything I had experienced with Eleanor. I was still skeptical that things had actually progressed, though, because I had convinced myself this baby was posterior and would take forever. Not long after that, I got into the bath. The hot water was a welcome relief at first, but the contractions were so intense and long that I was quickly getting overheated. That’s when I remembered the lovely ice machine and the giant cups and asked for some iced water. In between each contraction, I found my mouth so dry and started chugging water to keep hydrated. I felt out of control to be honest, and I found myself yelling the typical things that you hear women say – “I can’t do this!” It’s too much!” “I want this to be over!” “I want an epidural!” I don’t remember yelling or saying much at all when I was pregnant with Eleanor, but this was an entirely different scenario. Robbie and Bec, my midwife, kept reassuring me that I was doing well and that I could do this. Bec was trying to check the baby’s heart rate while I was working through contractions and trying to tell how things were going. She said she could see things progressing and that I was doing well. So I got out of the bath tub, and I actually found the cold air so refreshing in that moment. I got onto the bed for her to check baby’s position and to see how far dilated I was. This was the first time I had been checked, and it was probably only 3:45am or so. We had literally only been there for for about 45 minutes. She felt for the baby’s position, and he wasn’t posterior. He was at an angle but in a fine position. Then she checked me. I was shocked and grateful and in disbelief. Hearing that I was at 9cm was all I needed to have a fresh belief that the end was near. It was the most reassuring moment because I knew my body was doing what it was meant to do. I knew that these awful and intense and long contractions were actually transition – the hardest part of labor. It wasn’t in my head. This was reality, and it was incredibly gratifying to know that I was doing it. That I was near the end. I couldn’t believe it. She told me that my water just needed to break, and then I would be nearly ready to push. She thought my water would likely break within the next contraction or two. I got up off the bed and asked for a mat to kneel on and lean onto the bed. She also asked if I wanted to try the nitrous gas, and I said sure. She came back with the gas and the mat, and I hated both of them. I took one breath of the gas and wanted to throw up, so I quickly abandoned that idea. I started to kneel on the mat, and I was so uncomfortable and abandoned that idea as well. It’s crazy when you do this naturally because you can really feel every little thing so you know what your body needs and what it doesn’t need. I didn’t want the bath, and I didn’t want the mat. So I climbed onto the bed, and they raised the back of it upright. I draped myself over the back of it and held on for dear life. I was staring at the corner of the room and the floor, and I was kneeling on the bed. I felt as comfortable as possible. Robbie was up near my head, and the midwife left the room to get something. I was still yelling because the contraction kept going, and I was certain the baby was going to come out right then. I yelled for him to go find the midwife. I knew she needed to be in there right away. I seriously felt so out of control the whole time we were at the hospital. I felt like a crazy person, and I surprised myself by how much I yelled. They told me I didn’t yell that much, but I feel like I was crazy. They gave me specific instructions for pushing, and I tried my best to listen and do as I was told. Pushing without an epidural is insane. The human body is unbelievable. I just cannot even comprehend how God created our bodies to do this after going through this with no pain relief and coming out the other end in such great shape! I started pushing at 4:10am, and after a few huge pushes, Otis Daniel came into the world, fist pumping, at 4:19am! 2.5 hours of active labor. I cannot even believe it. We were only at the hospital for an hour and twenty minutes when we had our baby. My mom had a dream a couple months ago that he came really fast – boy was she right! I immediately turned around and sat down and held him to my chest like nothing had happened. The relief was instant. It was the most incredible moment. I felt so proud, and I kept saying to Robbie, “I can’t believe I did that. I can’t believe I did that.” I was shocked. My midwife Bec called my actual midwife Libby later that day, and she said, “You may want to call her. 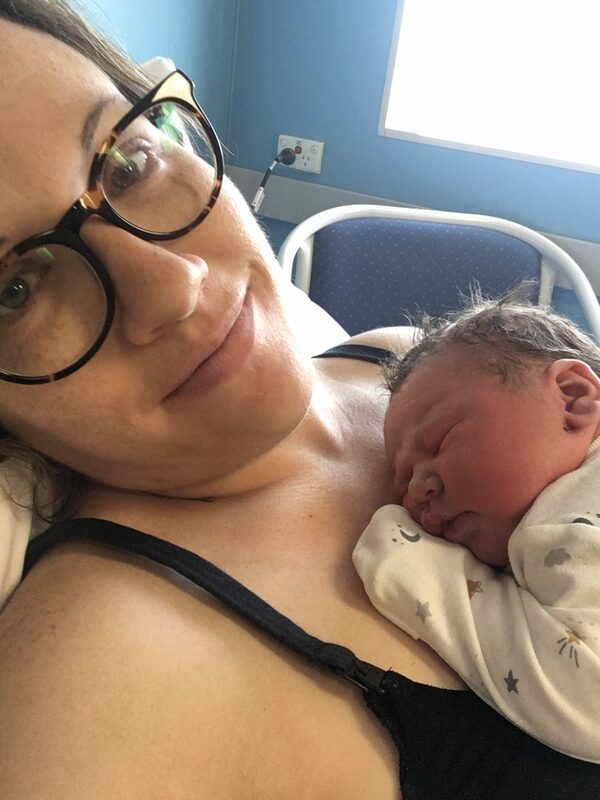 I think she may be traumatised with how fast it all happened.” Libby asked a bit more about it, and although she did get in touch with me, she felt confident after knowing about my first labor experience that I was likely feeling so happy with how things went this time. She was right. I was still in shock for a couple days, but I was so proud. Towards the end of my pregnancy, I was really doubting myself. I prayed so much into this and into the labor. I wrote out everything I hoped for in a note on my phone, and it almost all happened exactly as I had prayed and hoped. I prayed that God would show me that I could do hard things because I wasn’t believing I could at that point. The entire experience was so redemptive, and I am really grateful. We spent a few hours relaxing with Otis. I got checked out and repaired (only one tiny tear), and they checked Otis out to make sure he was all good. They weighed and measured him, and we were all shocked to find him two more pounds than Eleanor was at birth. Eleanor was 6lb 2ou, and Otis was 8lb 5ou! Their head circumference and length were exactly the same, though – 34.5cm and 48 cm respectively. Around 8:30am, they said everything looked great, and they would finish our paperwork before sending us on our way. We headed home around 9am – 6 hours after arriving at the hospital! 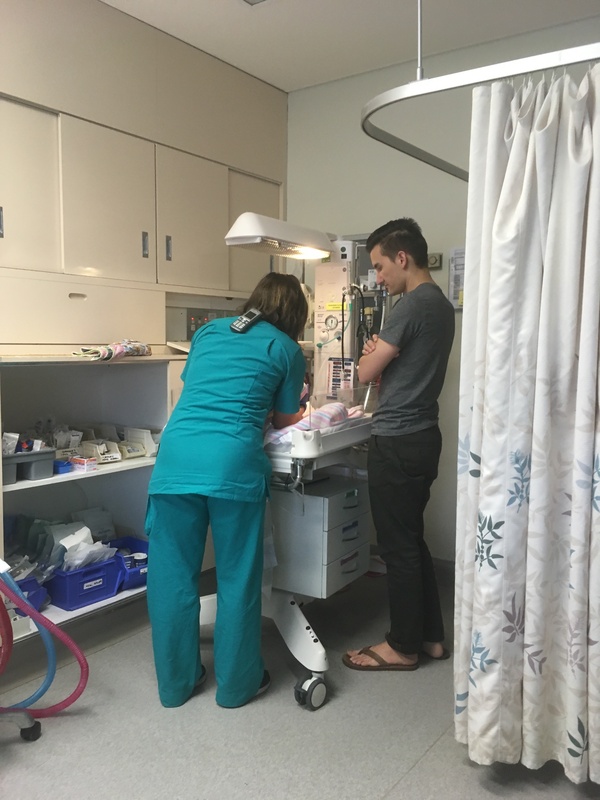 *The midwife program I went through is for low risks mums, and they allow you to go home 4-6 hours after birth as long as mum and baby are ok. Then your midwife does home visits for up to 2 weeks. I loved this program and so preferred coming home rather than to the post-natal ward with 4 women and their babies to a room! We got home to peace and quiet and were able to rest for a couple hours before my friend brought Eleanor home. Before I could rest, though, I sent Robbie down the road to get me food – the best ham and cheese croissant of my life! Around 11, Eleanor came home, and it was so wonderful seeing her and giving her a great big hug! She was pretty excited to meet her little brother, and we all settled in together before my parents arrived the next morning. Talk about perfect timing! Good job, Otis! I have two pretty different stories when it comes to childbirth, and I am so glad about that. I have experience with my water breaking early, with a long labor, with a posterior labor, with an epidural, with a tiny baby, with staying at the hospital, AND with a short and intense labor, with a completely natural labor, with a bigger baby, and with coming home immediately after. I will say recovering from a labor with no pain relief was actually a million times easier than when I had an epidural, but I am not sad about either experience. Every birth experience is so different, and every woman is so powerful and capable and should be proud. I have a renewed respect for the human body, for God’s willingness to let us create with Him and to bring new life to this earth. It’s such a beautiful privilege!